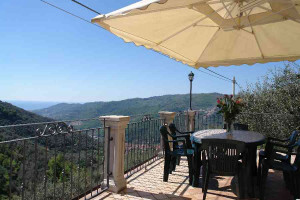 Visit Localita Monti during your stay in Liguria, Italy. The wonderful view of the sea and the mountains is breathtaking. With the beautiful location on the mountain the village offers a unique view from all directions. From Localita Monti you can tour the natural scenery while taking a hike through the area, or you can set out from here on mountain bike tours. Climbers will also get their money’s worth through the climbing paths offered. The small lanes of the village are attractive for walks; small, shady places offer a place for rest and relaxation. Localita Monti is a small village above Pontedassio. The place belongs to the Pontedassio municipality and lies in the hinterland of Liguria. The village was already inhabited in early Middle Ages. Localita Monti belongs to the Pontedassio municipality and is a village in the Imperia province which lies in the Liguria region. In the vicinity of Localita Monti are several other villages like: Bestagno (4.2km), Gombi di Ricci (1.9 km) and Diano Arentino (8.9 km). From Genoa take the Imperia Est highway exit on the Via Nationale towards Localita Monti bei Pontedassio.